Tony's Kansas City: TKC MUST SEE!!! KANSAS CITY GREEN NEW DEAL SUPPORTER RUINS FOX & FRIENDS RIVERSIDE BREAKFAST AT CORNER CAFE!!! TKC MUST SEE!!! 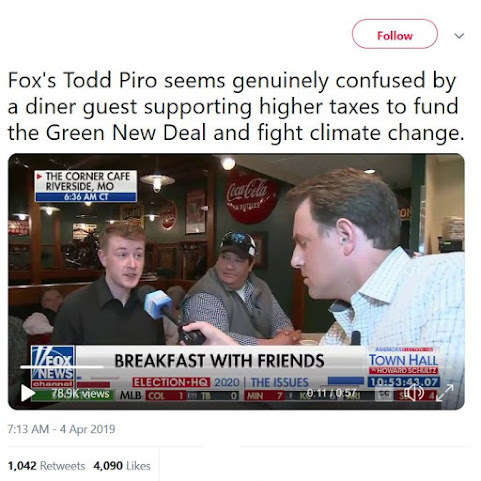 KANSAS CITY GREEN NEW DEAL SUPPORTER RUINS FOX & FRIENDS RIVERSIDE BREAKFAST AT CORNER CAFE!!! Snark in fairness to both sides: A soulless ginger armed with DNC talking points was planted in the crowd . . .
Only in flyover country is this news. The millinial talking is not versed in financials.. same as AOC. It’s funny hearing him talk... not much he said made sense... deeply offended by reference to WWII Vets he denigrated and insulted. Communism is and Nazi was... he compares to Green New Deal which is DOA? Youngsters need to not spend so much money on college and lattes. We're on the way. Hottest thing since Ferguson. TKC MUST SEE!!! KANSAS CITY GREEN NEW DEAL SUPPORTER RUINS FOX & FRIENDS RIVERSIDE BREAKFAST AT CORNER CAFE WHILE KC STAR PARENT COMPANY STOCK PLUMMETS!!! Sad part is… these idiots are our future. Ocasio-Cortez said on her live Instagram video that her busy schedule had prevented her from furnishing the luxury pad that comes with a shared infinity pool. As clueless and sad as AOC and others like her in Washington may be, the local versions of the millenial progressive creative crowd is that much worse. Just childish naive uninformed silliness. Just the kinds of folks who are likely to enroll in new "White Male Anger Management" classes at KU. Love seeing The KC Star plummet- they deserve it. Their business model is expanding people (editorial board) that insult people? As long as they believe that Jessie SMullets should be set free from felonies... people will let the journalism die a slow death. Liberals get what they deserve. AOC is the best thing Trump could have dreamed of... Besides MAGA hats.